I made this Roasted Tomatoes with Eggs and Quinoa just for myself. Ken doesn’t like this type of breakfast food. He’s more of a pancakes and coffee cake fan. That’s not to say that I don’t like pancakes and coffee cake. I do. BUT, I cannot stuff my face with those every single day or I would be as huge as a house. Somehow Ken is not as huge as a house. I need to figure out his secret to not always eating healthy, not always exercising and not being as huge as a house. This is a recipe for one but you can easily double, triple or quadruple it if you’re feeding more than just yourself. This recipe requires very little prep work. If you don’t have any leftover quinoa hanging out in your fridge, you can easily make some in a rice cooker. If you don’t have a rice cooker, GO TO THE STORE NOW and get one! It will make your life so much easier when it comes to cooking rice and quinoa. This gal doesn’t have time to watch a pot of rice or quinoa. I’m sure you don’t, either. OH, another convenient perk to this recipe – you can make it and take it. I do it all the time. I throw all of the ingredients in a container and take it to work with me. Breakfast and coffee at the work desk. Word. Turn your broiler onto high. Place the tomatoes in an oven safe dish. Drizzle with olive oil. Broil for 5 minutes or until slightly charred. Toss the quinoa with ½ tbsp of the parmesan cheese and a pinch of sea salt. Place in a shallow bowl or on a plate. In a skillet, cook the eggs to your preference. I cooked mine sunny side up. Place the eggs over the quinoa and then spoon the tomatoes over top. Sprinkle with the remaining parmesan cheese, oregano and black pepper. Yum, I need a healthy breakfast like this in my life. Today I just had a gloopy cookie and some sourdough pretzel nibbles. Not the best thing in the world. I like to have something more substantial and with lots of protein and nutrients to keep me going. This definitely fits the bill! Haha, sometimes I will stuff my face with cookies for breakfast. Then I think “what have I done”. It usually results in me making something healthy the next day! Thanks so much for stopping by, Amanda! This looks so good! It’s dinner time for me, so now I’m totally craving breakfast for dinner! Aww, thank you, Mary Frances! This is my kind of breakfast! I’ll almost always choose savory over sweet first thing in the morning. I need to remember to pick up some tomatoes so I can make this soon. It looks amazing! Great way to include quinoa in the breakfast recipes!! Thanks!! I’m subscribed, so keep churning amazing recipes:-)!! So much flavor for such a transportable recipe! Love it. Glad you like this recipe, Carla! Thanks for stopping by! 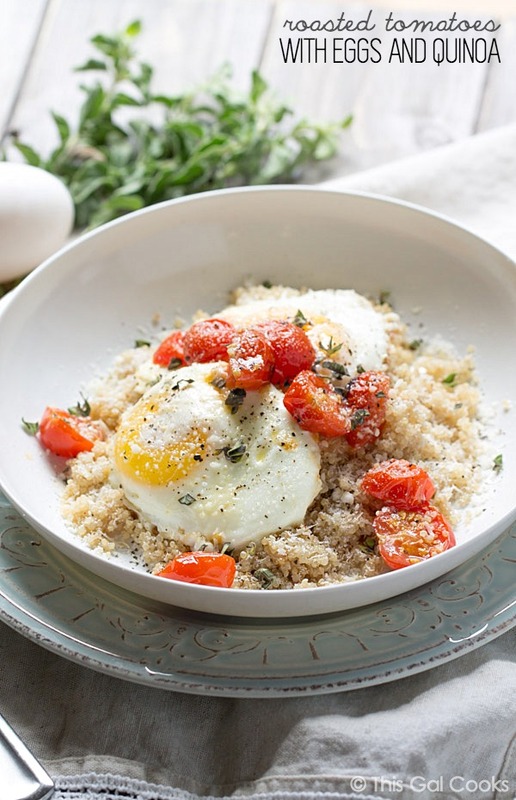 I surprisingly have never had eggs with quinoa before, definitely something that I need to try. Not only is this a super healthy start to the day but I bet it tastes great too! 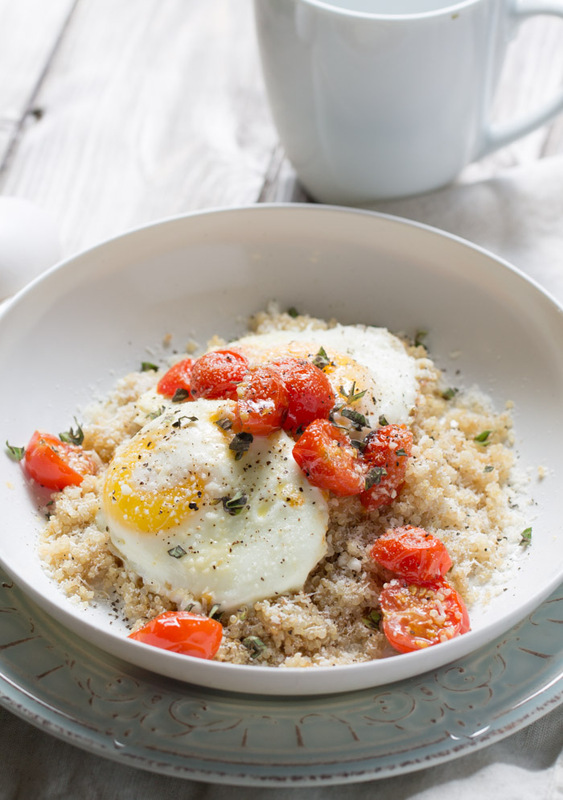 You definitely need to try eggs with quinoa. I’ve made it a few different ways; all are good. And healthy, too! Thanks for stopping by, Thalia! This is my ideal type of breakfast food! 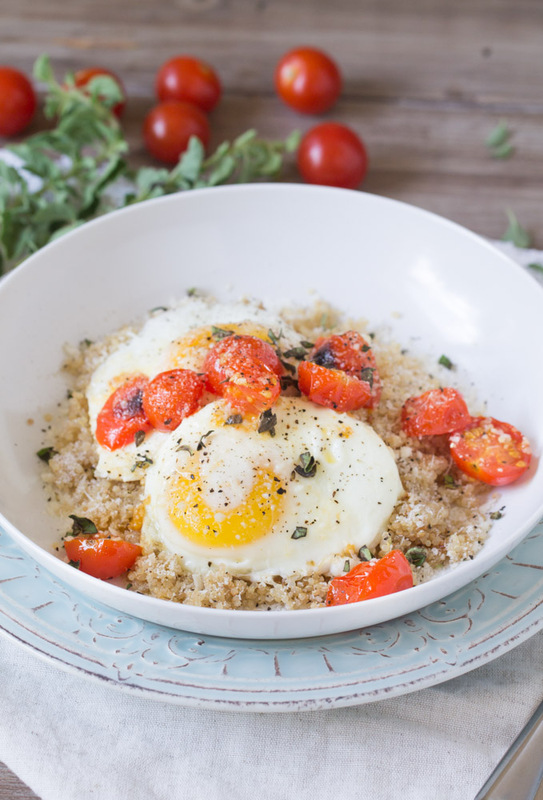 Yes, I like pancakes and what not, but roasted tomatoes with egg and quinoa… YUM! I always prefer meals that seem more like a lunch at breakfast. And this is so easy, so few ingredients! Gorgeous photos too. Pinning! Thank you so much for letting me know and for including my recipe in your roundup. Have a wonderful weekend! This is. Wonderful recipe. Thank you! !